Tag Archive | "Etroplus canarensis"
The Canara Pearlspot Cichlid (Etroplus canarensis) is one of the hobby’s rarest cichlids and was once believed to be extinct in the wild, only to reappear at a far east trade show in the early 1990s. It is also known to tropical fish keeping enthusiasts as the Banded Chromide, Pearlspot Cichlid, or Roman Numeral Cichlid. Etroplus canarensis are only found along the rocky banks of the slow flowing Kumaradhara and Netravathi river systems in India, and are named after the Canara district in the state of Mysore, southwestern India where they are found. 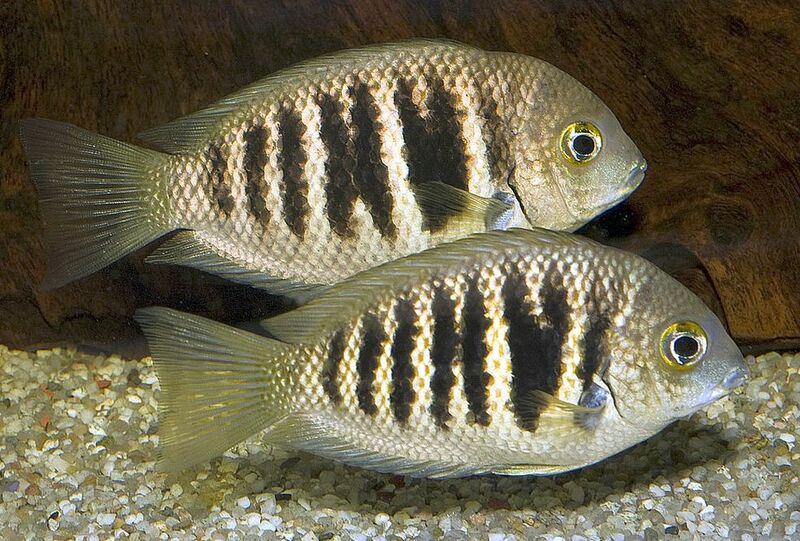 The Canara Pearlspot Cichlid (Etroplus canarensis) is found exclusively in the oxygen rich fresh waters within the downstream limits of its range which appears to be approximately 50 km from the mouth of the Netravati. Below this point, the species is replaced by the euryhaline congeners Etroplus maculatus and Etroplus suratensis. Unlike the other two fish in the genus, the Canara Pearlspot is found quite far from the coast and is not a brackish or hard water species. 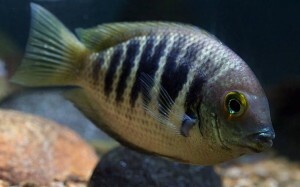 The Canara Pearlspot Cichlid normally has a series of 6 dark vertical bars on the body (excluding those on the head and caudal peduncle) and as the fish mature, they anterior three bars tend to bifurcate. Their body color is a buff gray and some of their body scales have a yellowish central patch. In Etroplus suratensis, the bars remain solid and their body color is a greenish brown with many body scales having a pearly white central spot. Male Etroplus canarensis are slightly larger and more stocky than females. Canara Pearlspot cichlids are best kept in an aquarium environment that mimics a slow moving river or moderately flowing stream. Ideally they should be housed in a large tank with a substrate of various sized river rocks, sand, fine gravel and even some small boulders. Some driftwood roots or branches can be added for aesthetics and hardy plants like Microsorum or Anubias spp. can be attached to the rocks or driftwood , but the majority of aquatic plants will be eaten by the fish. This species requires a high ratio of dissolved oxygen and spotless water conditions to thrive. They are highly intolerant to the accumulation of organic pollutants and will require weekly 30-50% water changes. Excellent water filtration and a strong water flow is essential to their well being. 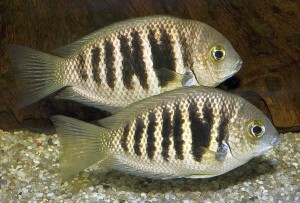 Canara Pearlspot Cichlids are relatively peaceful and loosely gregarious. They tend to form small groups and should be kept with at least 8 or more individuals in a single species tank. When housed in smaller numbers, weaker specimens may become targets for abuse by dominant individuals. In a community environment they should not be kept with territorial, aggressive, or hard water cichlid species and unless they are being bred, they will not predate on any except the smallest of fish. They are compatible with Rasbora daniconius, Barilius gatensis, Hypselobarbus jerdoni, Puntius mahecola, Haludaria fasciata, Garra mullya, Pristolepis marginata, Mesonoemacheilus triangularis, Devario malabaricus, Esomus danricus, Parambassis wolffii, Carinotetraodon travancoricus, Hyporhamphus limbatus, and even many Tetras. Canara Pearlspot Cichlids are substrate spawners that attain sexual maturity at 24 months of age and breed during December and January when water temperatures are cooler and the monsoon waters have receded. Simulating these conditions in an aquarium environment usually induces spawning activity. This can be achieved by keeping the breeding tank water temperature at 78-80 degrees for some time and then raising it up to 83 degrees and performing several 25% water changes using cooler water for several days, a few days apart. Keep in mind that most spawning problems with Etroplus Canarensis are caused by keeping them in hard water. A change in color pattern where the dark vertical body bars are replaced by a solid dark patch, and vertical bars appear on the front of the head indicates that breeding will soon take place. The pair will select a breeding site and defend the surrounding area against intruders until spawning takes place. The eggs are deposited on the side or top of a smooth rock where they are attached by short filaments. Both parents guard the eggs until hatching takes place (usually 96 hours at 80 degrees). At this point the eggs could be removed to a rearing tank as they are often eaten by tank mates or the parents however, after spawning, both parents will continue to defend the site even though the male may spawn with other females when available. The eggs need constant water movement to hatch and avoid fungus problems. The fry will usually be free swimming in 2 to 3 days at which time they can be fed newly hatched baby brine shrimp or crushed flakes. In the wild, Canara Pearlspot Cichlids graze on filamentous algae and aufwuchs. In an aquarium environment they will accept quality prepared flake foods but prefer small live, frozen, or freeze dried bloodworms , tubifex , mosquito larvae and brine shrimp. Also include significant amounts of Spirulina wafers, chopped peas, spinach, etc. to balance out their diet. Canara Pearlspot Cichlids are rarely seen by tropical fish keeping enthusiasts but can occasionally be purchased online or from specialty fish shops at a premium price.